The Bermuda Football Association on the advice from the Western Stars Sports Club Executive the St. John’s Field is waterlogged and therefore the match scheduled for today between the Dandy Town Hornets and the PHC Zebras has been postponed. At the Garrison Field, X-Road’s and the Paget Lions played to a 3 – 3 draw. The host X-Road’s got goals from Donavan Thompson, Q’Shai Darrell and Patrick Richardson, while the Paget Lions got single strikes from Dion Stovell , Akale Bean and Chare Smith. 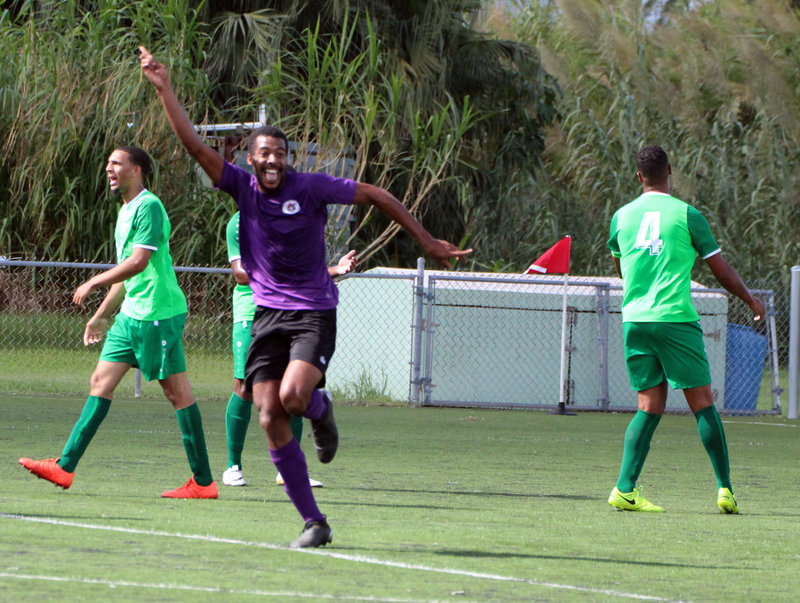 At the BAA Field, Robin Hood defeated BAA 6 – 1, Temiko Goater scored a hat-trick to lead the way, while Shakir Smith scored twice and Lejuan Simmons added the other. Nathan Rego scored the lone goal for BAA. The Devonshire Cougars recorded a 4 – 0 win over the North Village Rams at the Devonshire Recreation Club. The Devonshire Cougars got double strikes from Zari Simmons and Allan Douglas in their win. St. David’s traveled west to Malabar to take on the Ireland Rangers 3 – 2. Henry Santucci gave Ireland Rangers the lead in the 5th minute, but Jarreau Daniels equalized in 6th minute. Kontai Burton gave the visitors the lead in the 32nd minute, with Daniels scoring his second in the 77th minute to give St. David’s a 3 – 1 lead, santucci would pull a goal back for Ireland Rangers in injury time but time ran out on them getting the equalizer. The Southampton Rangers made it 7 wins out of nine matches as they continue to lead the league after picking up a 6 – 1 win over Wolves at the Garrison Field. Donte Brangman would score twice for the visitors, while Jarazhino Basset, Cardel Henry, Ezekiel Stoneham and Maquel Nisbett-Tankard all added a goal each, while Marcus Ming score the lone goal for Wolves. The St. George’s Colt won the battle of the Colts at the Wellington Oval after they defeated the Devonshire Colts 2 – 0. The St. George’s Colts took the lead in the 50th minute when David Signor scored and then in the 83rd minute Sage Paynter would double the lead earning the home team the win. At the Police Field the visitors Somerset Eagles would grab all three points following their 2 – 1 win over Young Men Social Club. Leo Burgess gave the Somerset Eagles the lead in the 7th minute, Jahnair Lewis Trott equalized for the Young men Social Club in the 35th minute, but Anwar Telford would strike in the 45th minute to earn the visitors the three point as there was no scoring in the second half.